Below please find some of my former undergraduate projects. 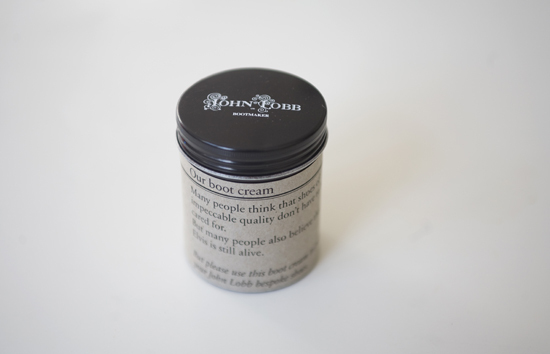 He is "the shoemaker of the kings and the king of the shoemakers". John Lobb Ltd. 9 St. James's Street, London. 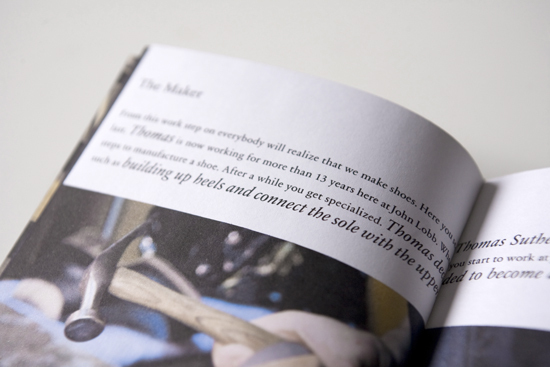 John Lobb manufacturers the finest handmade shoes over 150 years. The shoes are not keeping up with the times, but they are still modern. The rest of the appearance looks still 150 years old. My design is to bring John Lobb back to present days. Every shoe box includes the dimension drawing. A simple silhouette of the foot and only a few numbers. Lying underneath the dimension drawing is a little book that introduces every employee and every single working process. On the last page it shows each seal of all employees. 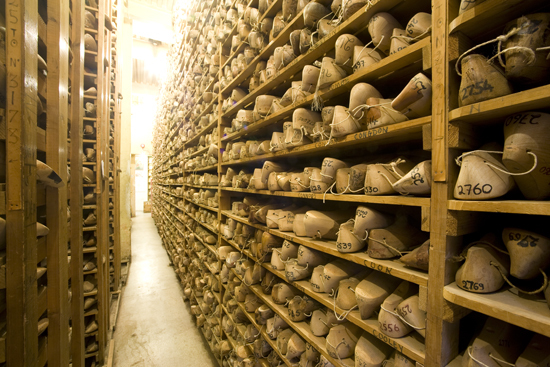 Due to the print at the shoe box, every costumer could relate who was exactly working done by hand over a number of hours at his shoes. 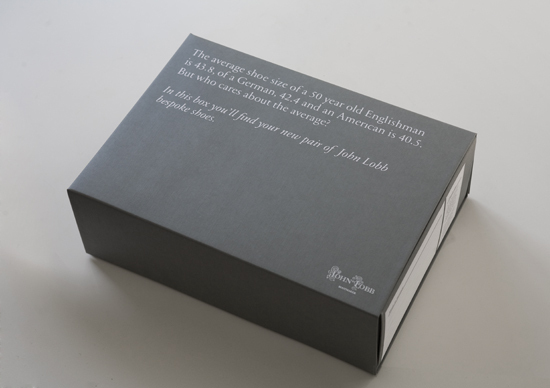 Shoes boxes and shoes creme are printed with typical provocative english slogans. Who needs the power a chocolate bar? People who work really hard or work with a shovel on a building site. But to open a chocolate bar, by gently tearing away the wrapper, doesn’t look very powerful. The most powerful chocolate bar needs help to achieve this. Against millions of sandwiches, one Balisto doesn’t stand a chance (my mother said). But how could Balisto appeal to the early riser? I realised, that when I buy my Balisto in the supermarket, the whole morning has already gone. Normally you will find the Balisto tucked away, in the sweetie container of the typical kitchen. So out of the container and out of the cupboard! My packaging is a bar dispenser, which can be strategically placed on a fridge or any other suitable surface. The bars securely sit in the simple, cardboard constructed, geometrically designed dispenser. Different variations would be offered for different families. It’s better to give Mars “Celebration” as a gift at a party because with Amicelli you‘ll never get another invitation! But what’s the reason for this? The current packaging doesn’t look good and doesn’t „offer“ itself. With this task, I completely reworked the packaging in form, function and design. By using the principle of a small upturned paper umbrella, my package unfolds like a flower on the table. 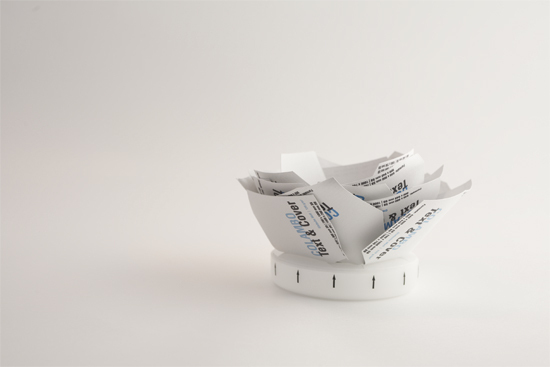 A basic cardboard strip and a paper plate offers a simple appealing folding device. Now it becomes: A stylish invitation. Römerturm offers the finest paper. But until now, it has been presented in dusty, boring sample boxes. Therefore, the statement, “finest paper are our passion”, is not inappropriate, but passion looks differently. Due to this reason, I wanted to unleashed the paper. It should completely unfold its quality and elegance. It should flourish. Our aim was to find a sustainable alternative to the versatile sandbag. In regard to costs, flexibility and flood level height, our new system should be distinctive to the current market. Construction, transportation, insurance claims, responsibility and duties were very important considerations. The principle of the system is very simple. A foil, with a thick rubber lip is used in conjunction with the static stand. As water covers the foil, the weight of the rising water then depresses the foil against the ground and hence blocks any further water rising. Consequently, flooding’s biggest enemy becomes an ally in flood protection (in cooperation with Philipp Raupach). Also see: Laschke, M. and Raupach, P. Wassersperre. DE Patent, (2010). A group of four art colleges designed gifts and giveaways for the German Foreign Office and the German Embassies. With this umbrella your never feel like left out in the rain. It shows the translation of useful phrases such as “Good morning and “One beer, please” on the inner side. Currently it is available in Arabic, Chinese, English, French, Portuguese, Spanish and Turkish (in collaboration with Sven Quadflieg). I designed “Ole”. Ole is a bathroom-system for handicapped people, to assist them with their personal hygiene regime. But my personal endeavour was to design Ole, avoiding the usual “handicap appearance”, we all are acquainted with from other handicap systems. Hospitals and Care centres being the target customers. Ole can be utilised in almost every architectural application and room size. All additional hand grips and wash basins are integrated.